(by former New York City Mayor Rudy Giuliani, NY Post) – A city with homeless on its streets is a city that has no love of its people. The so-called “progressive” view, that people have a right to live on the sidewalk, is not only legally devoid of any merit but is inhumane, indecent and dangerous. As is the case in many other policies – redistribution of wealth, social engineering, weak national defense – it’s a contradiction to describe this stance as progressive. It should properly be regarded as retrogressive. People living on the street, urinating and defecating there, marked the Dark Ages of Western civilization. In a humane, decent and civilized city, the problems of the homeless are dealt with through intervention rather than denial. My analysis of social policy always begins with how I would treat my child, sister, brother or friend if they fell on hard times. Suppose I found someone I loved living on the streets. What would I do? Let him remain there because he wants to and claims some fictitious legal right to do so? Or would I find out what was wrong and intervene, even if a bit of tough love was necessary? When family members aren’t around or can’t handle the problem, it falls to the government. Under my hypothetical situation, I would find out why he is on the streets. Is he without funds to pay rent? Is he drinking too much or taking drugs or suffering from mental illness? In any one of those situations, I would suggest and then, if necessary, exert pressure on him to get appropriate help. If it’s simply a lack of housing, I would find him a place to live and as soon as possible find him a job so he could regain the self-respect to care for himself and his family. If he is an alcoholic or drug addict or suffers from mental illness, then I would bring him to appropriate programs – many of which have great success in dealing with these afflictions using therapy and medications. Under no circumstances would I leave him an option that does not and should not exist in a loving city – a right to live on the streets. This approach is not hypothetical. As mayor of NYC, I utilized it and was able to successfully remove the vast majority of homeless from the streets, providing humane and effective solutions for many of their problems. This should be at the core of a city’s program for the homeless. The plan we followed was simple and effective. We didn’t need a task force to devise it, and it should be utilized now by New York City before we become a homeless haven like we used to be. The police should approach every person attempting to sleep on the sidewalk and tell them they are not allowed to use the streets as a bedroom and toilet. If he only needs a place to stay, that can be provided. If he needs a job, the city should help him find one as my New York City Job Agency did, or if private work can’t be found, he can be required to work for the city for the legal limit of 20 hours a week. This will instill or maintain a work ethic – easily lost if you get something for nothing. It will also teach and reinforce that you must contribute to earn money. If the problems are more severe, then referrals can be made to alcohol and drug rehabilitation programs and for mental evaluation to determine if therapy and medication can be helpful. This will not work with everyone. In my experience, it worked more often than not, but not always at first. It’s always best if the police officer is accompanied by a social worker – as often was the case – to explain to a homeless person that coming in for an evaluation is better than walking all night because, if the person refuses to come, he will be followed and not allowed to sleep outside anywhere else. Under my program, most came in for evaluation and some just left the city. When I was mayor, we did all we could to remove the homeless from the streets not only for safety and sanitary reasons, but out of love and compassion for each of the homeless as persons, as children of God. The situation only deteriorates for people allowed to live on the streets. It often leads to drinking and drugs. 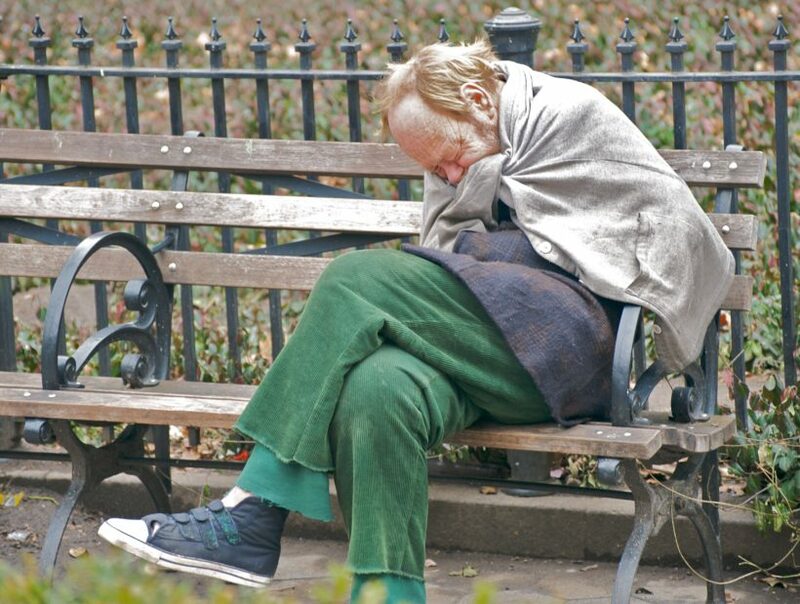 As for the mentally ill – about 40 percent of homeless have been, according to some studies, described as paranoid schizophrenics – as they become more isolated, their illness becomes much worse, too often leading to violence committed by them or on them. If a person wants homeless people living on their doorstep or if a church wants to allow people to sleep on its steps, then they should be invited in to give them adequate protection and sustenance. In fact, anytime you see homeless people in the doorway of a church bedding down for the night, ask yourself why the church hasn’t invited them in. Difficult, seemingly implacable human problems need even more determined interventions rather than repetitions of retrogressive, old-fashioned applications of left-wing guilt. We had a strategy that worked. Why was it abandoned? Rudy Giuliani was mayor of New York City from 1994 to 2001. 1. The purpose of an editorial/commentary is to explain, persuade, warn, criticize, entertain, praise or answer. What do you think is the purpose of the Rudy Giuliani’s editorial? Explain your answer. 3. a) What problem does Rudy Giuliani describe in his commentary? b) What solution does he propose? 4. For each of the following statements made by former NYC Mayor Rudy Giuliani in his commentary, write agree or disagree and explain your choice.